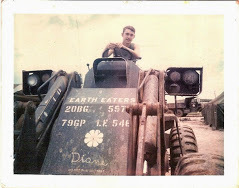 The year I was in Vietnam (1970), American engineer units were turning over all of their heavy equipment to the South Vietnamese engineer companies. The United States was winding down the war. My unit, 31st eng battalion, 79th Group, was responsible for supervising on-the-job training for the modern equipment we were giving the South Vietnamese. One night, after a day of showing the ARVN's how to operate a bucket-loader, I got roaring drunk with some guys in my squad and some ARVN soldiers. We drank Tiger beer until the early morning hours. Passing out, one by one in the hooch that served as a makeshift bar. None of us were too concerned about the war that night. We were near a bridge. Somehow, in my drunken state that night, I managed to stagger outside to relieve my aching bladder. Like all the bridges in South Vietnam, there was some security. In this case, security was a common anti-swimmer device consisting of concertina wire suspended from floating buoys and secured on the river bottom. Tidal fluctuation, prevalent in most of Vietnam's waterways, caused the concertina to shift and agitate unpredictably, making it miserable for anyone who tried to swim through it. There were also guards at various points and lights on the bridge itself. That night I was slowly staggering south of the bridge looking for a place to pee. I vaguely remember going towards the water, my boots and pants getting wet, when suddenly someone grabbed my arm and pulled me towards the river bank. It was a young Vietnamese boy. Maybe eleven or twelve years old with a grim look on his face. "Nguy hiem" (dangerous) he warned me. Then he disappeared and I passed out. At daylight a guard found me sleeping on the river bank. When I told him what happened he shook his head in wonderment. There were no civilians in the camp, and certainly no children. Who was my benefactor? For weeks afterwards I told my story to everyone I met, hoping I'd find out who the boy was. I left Vietnam without finding out who saved me from being caught by that concertina wire and drowning in my drunken state. It's one mystery I guess I'll never solve.